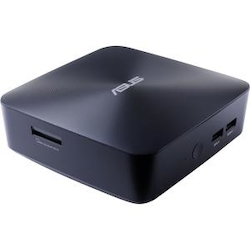 ASUS VivoMini UN65U packs the solution for all of your home computing needs into a lightweight mini PC that's only slightly thicker than the average wallet. The UN65U is powered by the latest 7th generation Intel Core i7 processor and features a dual-storage design for added flexibility, as well as a M.2 SSD for data speeds of up to 10Gbps. The UN65U is a quiet performer that keeps noise levels down, thanks to an optimized low-speed fan design.The UN65U provides incredible 4K UHD on one display or HD support across three displays, making multitasking enjoyable and effortless. With 802.11ac Wi-Fi and the exclusive ASUS Media Streamer and Remote Go! apps, the UN65U is an ideal home entertainment PC and the best mini PC to connect to a HDTV.